How do you explain the moths in England changing colour to survive industrial pollution if evolution isn’t true? For many years the Peppered Moth Biston betularia has been used in high school textbooks as the prime example of evolution occurring before our eyes, so let’s look at how this claim came about. 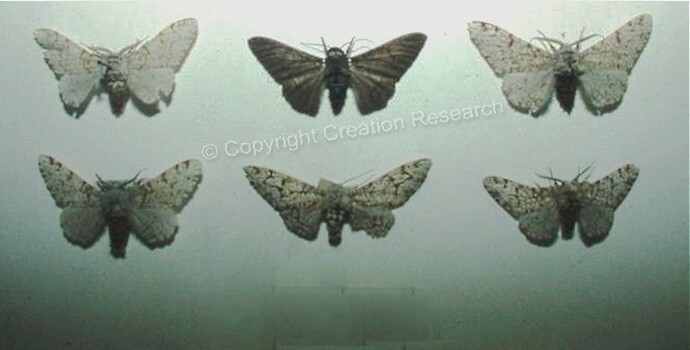 The Peppered Moth occurs in two main colour forms, one pale with black speckles, the other solid black. Before the early 1800’s the black forms were rare, but over the next century they gradually increased in numbers, especially in regions surrounding rapidly industrialising cities like Manchester. At the same time the number of light forms decreased. The change in proportion of black and speckled moths was believed to be caused by birds eating the moths whose colour did not blend in with the colour of the tree trunks on which the moths rested during the day. The logic was simple: In non-polluted regions the tree trunks were covered in lichen so any speckled moths resting on them were well camouflaged, but black moths on clean trees would have been highly visible, and therefore easily spotted by hungry birds during the day. This left the more speckled moths to breed, and give rise to new generations of the light coloured speckled forms which resulted in more light than dark forms in the moth population. However, in polluted regions the tree trunks became covered with soot, which also killed off the lichens leaving the tree trunks black. In these regions black moths would have been well camouflaged, but the pale speckled moths would be more easily spotted and eaten. In these areas it was argued that more black forms survived to breed and produce generations of black moths so the ratio of dark to light moths increased. This increase in numbers of black moths was called “industrial melanism,” and has been presented to generations of biology students as a classic example of natural selection, and therefore evolution, since according to Darwin, natural selection produces evolution. In order to prove that the increasing numbers of black moths was a case of natural selection and hence evolution, Ernest Kettelwell carried out a series of experiments during the 1950s. He released light and dark moths onto tree trunks in two different regions in England, one where the trees were blackened by industrial pollution, and the other an unpolluted area whose trees were covered in lichens. Kettelwell later recaptured moths from both regions and recorded the numbers of each form that had survived. As he expected, more black moths survived in the region with black tree trunks, and more light moths survived in the region with lichen covered tree trunks. Although Kettelwell’s results were often used a proof of evolution, scientists who studied moths recognised serious flaws in Kettlewell’s method. So it seems the link between polluted trees and selection for black moths remains popular but unproven. Because of the criticisms of Kettelwell’s work Michael Majerus repeated the experiment, but corrected the experimental design. Majerus made his observations over six years in Cambridgeshire, (actually in his own garden there) where trees had never been damaged by pollution, yet both speckled and dark moths existed. Majerus found that birds did eat moths that were less camouflaged, i.e. the black ones more than on the light ones, and this difference in predation rate is enough to change the relative numbers of dark and light forms in succeeding generations given enough time. Majerus was unable to completely repeat Kettlelwell’s original work on moths by studying the effect on moths of living in soot-blackened areas because anti-pollution laws have resulted in the industrialised regions of England being cleaned up, so trees are no longer soot blackened, and black moths seem to on their way to becoming as rare today as they were in pre-industrial times. Majerus died in 2009, but his colleagues have published his results in Biology. Letters 8 Feb 2012, doi: 10.1098/rsbl.2011.1136. They concluded their report with: “The new data, coupled with the weight of previously existing data convincingly show that ‘industrial melanism’ in the peppered moth is still one of the clearest and most easily understood examples of Darwinian evolution in action”. To answer this question we need to consider what has changed? Has the moth changed colour? Historic moth collections show both speckled and black forms existed before the industrial revolution, so the moth has not changed colour – all colours options existed before any selection took place. The only recorded change has been the proportion of speckled and black forms in succeeding generations as the industrial revolution came and went. Although there is confusion about the cause of this. In the USA where industrial pollution of trees has never been a factor, the percentage of colours has changed as in the UK. Although industrial pollution is not usually regarded as natural, predation by birds is a natural selection force, but birds could only select from moth varieties that already existed. Selection is the process of choosing something from an already existing set of options, but selection (natural or artificial ) has never been observed to create the options, or change them into something different. It has always resulted in some options being removed and some remaining. Now, let’s apply this to peppered moths. Wherever black moths were more visible, and birds ate more of the black ones, i.e. selected them out, this definitely would have left more speckled ones to breed. Therefore, the most common form in succeeding generations would be speckled. Therefore, as the trees became soot-blackened and speckled moths became more visible, birds could have more easily have selected them for dinner, leaving a larger number of the black ones to breed, which produced generations of black moths until the trees recovered from the pollution, and the black forms were once more subjected to selection. Does natural selection produce evolution? Note well – natural selection did not produce the moths, and it did not produce the moth colours, although it probably did alter the ratio of dark to light moths on clean trees in Cambridgeshire. But natural selection is a actually a destructive process, so if allowed to go to on for too long it could potentially remove the ‘dark gene’ from the population of living things and reduce the gene pool. It has no observed track record of changing living things into new kinds of living things. Natural Selection is a real process, but it cannot produce evolution. The exact gene that produces the black form of the moth has not yet been found, but scientists are working on it. It seems to be a control switch that regulates the activity of pigment producing genes that produce the colours and patterns of wings in moths and butterflies. (Ref. 2) A change in regulating gene does not add any new pigment genes to the moth. Therefore, the black moth did not come about by the addition of any new genes. We suspect it is the result of a control switch being left on when it should have been turned off, or vice versa. This is not evolution. It is merely the loss of a control system than normally produces patterns, so that it now only produces solid colour. Prior to his death Majerus admitted that his motive for restoring the peppered moth as an icon of evolution was to campaign against creationism. 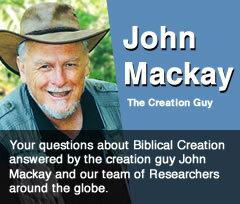 He claimed: “To have people believe the biology of the planet is controlled by a Creator, I think that’s dangerous”. (Science, 25 June 2004) All students need to know this, along with the fact that now that Majerus has departed this world, he has discovered how much more dangerous it was to reject the Creator of both moths and men. See how the classic evidences claimed for evolution really fit with creation. Read the Creation Research brochure Evidence from Biology Download PDF here.